Used to be that naming planets was a fairly simple task. The Ancients looked up towards the skies, observed that a handful of stars travelled across the sky (and, in fact, planet means “wanderer”) and gave them a suitable name that reflected what they saw. For example, Mars, glowing red in the heavens, was named for the Roman god of war. And it wasn’t just the Romans who considered this planet the embodiment of conflict and challenges, many cultures and their languages also saw fit to give it this distinction. The Greeks called it Ares, Hindus call it Mangela, Hebrews call it Ma’adim, in Sanskrit it is known as Angaraka, and in Babylon one would notice the rising and setting of Nergal. With the advent of stronger telescopes, more planets within our solar system were discovered, though not bright enough to spot with the unaided eye (mostly – if you know where to look on an incredibly clear night in the middle of a very dark, dark field with absolutely no chance of any interfering light from any source, you might see Uranus, but that depends on other conditions, too). I’ve seen Jupiter’s four bright moons, through a telescope but with my own eyes, too (but you have to cover up Jupiter with a magazine to see them; it’s much less of a challenge to spot them even with birding binoculars or a decent pair of opera glasses). Nowadays, we have a problem of riches. Thanks to the hard work of astronomers, astrophysicists and others trained to observe the telltale signs of wobble and movement, there are over a thousand planets at our disposal. Sure, they’re ridiculously far away and chances are you’ll never see any of them though your backyard reflector. But you might see the star they’re rotating, and imagine what kind of life lives upon these exoplanets, as they’re called. Do you want to blow your mind? The New York Times has an amazing interactive graphic that’ll keep you busy for hours. I can’t even find the words to describe how amazing this chart is, but if you check it out, make sure you scroll down to the end. I won’t give away what’s there, except you’ll gasp and say, “hmm! 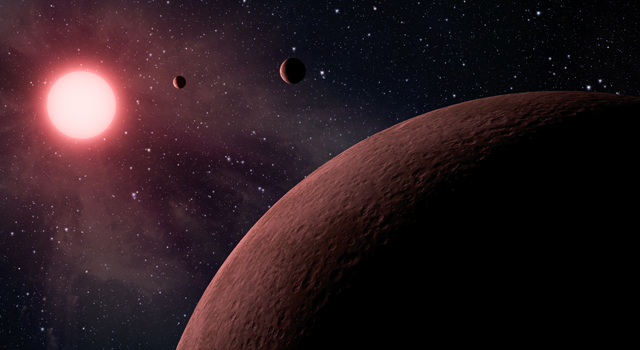 The ones found are the result of NASA’s Kepler mission that have confirmed planets rotating around stars. If you click on some of the graphics on the above link, up will come information about the planet and its sun. Of course, it’s impossible to find appropriate names for this batch that seems to be growing daily. That doesn’t mean there hasn’t been attempts. The International Astronomical Union is sponsoring a contest for that very purpose. Have any ideas? Here’s your chance to honor a hitherto anonymous planet with a memorable, catchy handle, just as you would a baby. Trouble is, what would the inhabitants of said world think?